YOU know you are doing great things in your school and community… YOU know you are working hard to support positive choices by your peers… YOU know your work makes a difference, changing lives one decision at a time. SADD Shines Week takes one week out of our busy year for schools and communities with SADD chapters all over the country, to CELEBRATE YOUR efforts to keep your peers safe and healthy! We are pleased to present SADD Shines: The Power of You, always held the first week of February or any time during the month. 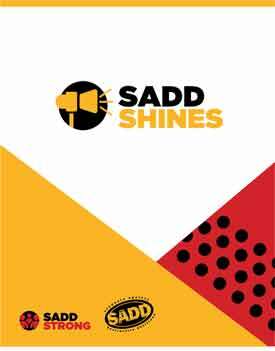 SADD Shines is a national core program designed to guide teens, parents and communities to celebrate SADD and highlight the important issue of student personal health and safety with an emphasis on tobacco advocacy and prevention. SADD Shines Day was created in 2013 as a way for SADD chapters to celebrate the positive impact that teens are making across the country. Since then, the program has evolved into a nationwide celebration of SADD and a platform to address student personal health and safety, with a focus on tobacco advocacy and prevention. SADD Shines would not be possible without partners in the field. SADD is pleased to partner with the Campaign for Tobacco-Free Kids and Take Down Tobacco! The lessons utilized in SADD STRONG are excerpts of the larger, comprehensive Taking Down Tobacco course.